Compare ice cream multipacks from ALDI Monarc Indulge, Weis, Connoisseur, Magnum, Bulla, Drumsticks, Woolworths, Paddle Pop, Cornetto, Coles and Cadbury, on taste, value for money, consistency, packaging, variety and overall satisfaction. Canstar Blue research finalised in March 2019, published in April 2019. ALDI Monarc Indulge has topped Canstar Blue’s ice cream multipack ratings. The brand earned five-star reviews from customers on value for money, packaging, variety and overall satisfaction. Who loves ice cream? That’s right, everyone. Well, maybe everyone except for those who are dairy intolerant. Ice cream is the go-to dessert for so many occasions – we eat it when we celebrate, and we eat it to help drown our sorrows. 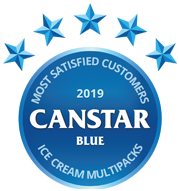 Canstar Blue thought it was about time to find out which ice cream multipack brand is rated highest by frozen-treat-loving Aussies right across the country. To do this, we surveyed more than 900 consumers who have bought and eaten ice cream from a multipack in the last three months – in this instance we’re talking about brands that offer packs of individually wrapped ice cream you find in your local supermarket or convenience store, as opposed to the ice cream you buy and eat during a day out at the beach, for example. We asked respondents to rate the brand of ice cream they bought and enjoyed (or otherwise) based on taste, value for money, consistency, packaging, variety and overall satisfaction. Eleven brands achieved the minimum sample size required to feature in our inaugural ice cream multipack review. They include all the big names you usually think of when it comes to ice cream, as well as private label brands from supermarket chains Coles, Woolworths and ALDI. In the tasty line up, only one brand achieved five stars for overall satisfaction – ALDI Monarc Indulge. It received five-star reviews on all rated variables except for taste and consistency, in which it got four stars for each. It seems consumers are hard to please when it comes to ice cream, with limited five-star reviews across the board. Weis, Connoisseur and Magnum got four stars for overall satisfaction while Bulla, Drumsticks, Woolworths, Paddle Pop, Cornetto, Coles and Cadbury were left on three stars apiece. Notably, Weis was the only brand to achieve five stars on taste, while Connoisseur was the only one to receive five stars on consistency, plus five stars on variety along with ALDI. In addition, Cadbury scored five stars on packaging, as did this year’s winner. According to our survey, 16% of respondents eat ice cream every day during summer, with two in five (39%) stating they prefer to eat single serves compared to a tub – it certainly might help with portion control! One in five adults (21%) only enjoy the treat on special occasions and 17% feel guilty eating it. Nevertheless, 36% say they buy ice cream on their regular shop. So, what is ice cream anyway? 168 g/L of food solids. ALDI is a hot favourite when it comes to everyday groceries – from multigrain bread to sliced cheese as well as ice cream. Its Monarc Indulge range features a range of flavours and sizes, and even comes in a 1L tub for those who looking to truly indulge. Expect Vanilla Opulence, Coffee Mocha and Caramel Honeycomb Temptation flavours just to name a few. 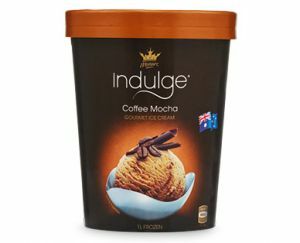 With descriptions like “irresistibly rich coffee mocha ice cream swirled with a delightful chocolate ripple and chunky chocolate pieces”, it might have your mouth-watering too! Canstar Blue surveyed 3,000 Australian adults across a range of categories to measure and track customer satisfaction, via ISO 26362 accredited research panels managed by Qualtrics. The outcomes reported are the results from customers within the survey group who have bought and eaten ice cream from an ice cream multipack from a supermarket or grocer (i.e. not from an ice cream store or café/restaurant) in the last 3 months – in this case, 980 people.